It’s tough getting your business or brand to stay top-of-mind for your audience. But with strategic content curation, you can become the go-to industry source they’re looking for. There’s one problem, though: So. Much. Content. Those three words probably sum up the internet as a whole. As days pass, more and more content gets published, good or bad. This is a serious blow to digital marketers everywhere. They have to compete more strenuously for the market’s attention and have an advanced content ideation strategy just to keep up with their competitors. Every piece of content your competitors create is another item to compete with. Furthermore, every piece of content that even non-competitors create is also competing for the attention of your audience. But what if it’s actually the opposite? What if you could use all that non-competitive content to your own advantage? What if all content could become stepping stones in creating an entirely solid piece? What if you can use other’s work legally, and still get big benefits for your own business? My friends, we are talking about content curation, a not-so-new concept that top marketers have been utilizing for years now. Proper content curation can yield extremely big results that might surprise you. This is all in an effort to teach you how to leverage other people’s content to stay top-of-the-mind for your audience. Before we get into the “how-tos” of content curation, let’s talk about the methods you can use to publish curated content. Social Networks: This is probably the easiest way to distribute content. Curating here also helps you keep your social followers engaged with regular content. This article will focus on curating for the social network and blog channels, but the principles can be applied to video as well. There are six types of curated content. Think of these as different formats that will create an interesting variety for your audience. You’ll want to have a mix of all these types in order to make sure your audience doesn’t get bored. It doesn’t get much more basic than this. Sharing an article on your social networks is the simplest and easiest way to begin curating content. And you’re probably already doing a version of this. It’s important though that you remember that every piece of content you share on your social channels should be a reflection of the kind of value you want to bring your customers. So you want to do more than just click the share buttons on an article, you want to say something valuable about the content you’re sharing. Add commentary, highlight a specific point in the article, or just introduce the topic to give your audience a reason to click through. 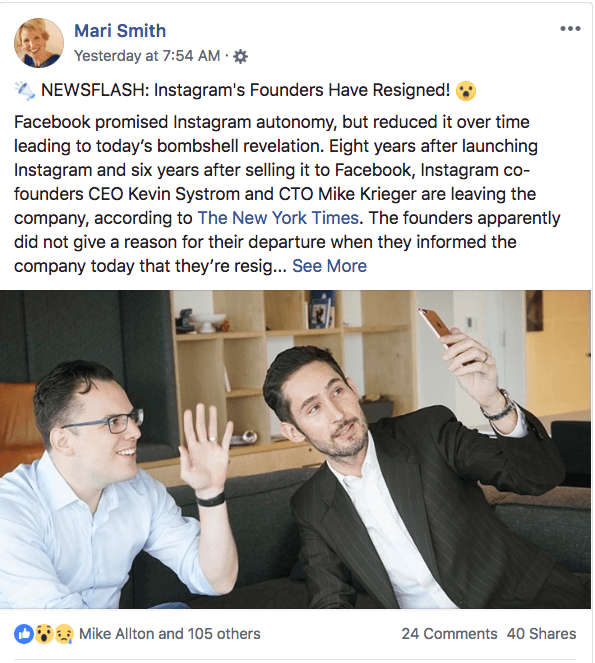 While this is the simplest form of content curation, it’s also the easiest way to look “spammy” to your audience if you’re not giving value with every curated content share. Lists are, well, lists. It’s when you reference multiple sources of information rather than just one. You’ll see all they did was introduce the overall concept or topic with a list of resources about that topic. Easy, right? But how can you apply this same thing to your blog content? Actually, lists can be one of the biggest evergreen content types on your website. As long as you see new things you can add on your list that can provide value to your audience, you can continue to update it and keep it fresh. A great example of this is Jason Acidre listing 100+ Advanced Online Marketing Strategies. As the name suggests, creating distilled content means that you take the best points from different sources and curate them into one post. This is perfect for today’s world where content is being dished out non-stop. More content means more things you can distill! For example, let’s say you com across five different articles that talk about how to create social media buzz. You notice that they have similar points, but there are also some things about them that are different. To distill them, take the different points in their respective articles, create an entirely new piece, and add to it. A slightly different example can be seen in an article from Search Engine Journal where they list out the 25 Best SEO Blogs & Resources to Learn SEO. The article lists the best content from 25 different sources for people who are new to SEO to learn from. They’ve “distilled” what would have otherwise been thousands of articles that a newbie would have to search through, and created one single resource for them. This format is best published as a blog post, as it tends to be more long-form. This might be one of the best types of content curation that marketers can do. It has multiple benefits when done correctly! To crowdsource, ask multiple people a question and put their answers in one social post or one blog post. When planning this type of content, remember: the goal is to ask topical influencers, people who are known experts in the topic area. If you gave out questions to a list of popular influencers from your industry, then you will have a very powerful set of answers that a lot of people will trust and benefit from. Since the content is already done and laid out, crowdsourcing minimizes what you need to write. It also brings in automatic content amplification (word-of-mouth, social shares and/or backlinks). The people who have contributed will naturally want to share it since they’re quoted in it (and it makes them look good). Try it; it really works. Our team has used this same tactic in the past and the results have been fantastic! Some articles continue to bring in traffic years after the initial creation. Best used with images (and popularized with the term “mind mapping”), this type of content allows you to collect and organize various elements on a specific topic. 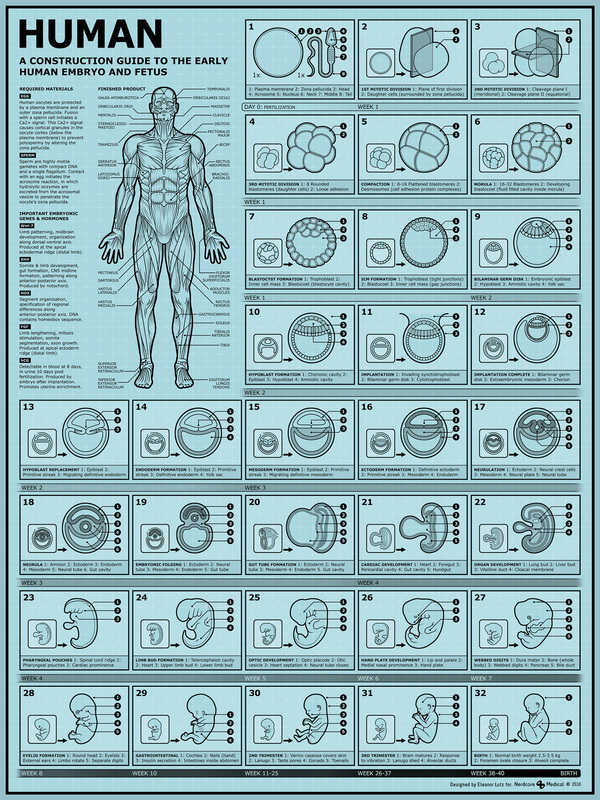 Then show how all the key components define the topic as a whole. And there you go! You have an amazing piece of content that can serve multiple uses. Here’s an example of one mindmap from Tabletop Whale named How to Build a Human II to see what mapping works as a curated content. Although very effective when done correctly, mapping can be difficult to prepare, especially if you don’t have an in-house creative team. Also, you must be absolutely precise on the information you are going to use in order for it to be a solid piece of content. This type of curated content is both basic and difficult to pull off. You might be familiar with remixes from the world of music. The concept is similar when applied to content curation. A proper remix is a new piece of work produced when you “mash-up” old pieces of content. You try to break down interesting points and assemble them into something that is fit for your audience. The Everything is a Remix video series has done this remarkably well! There! Six types of content which you can use for your content curation strategies. We highly suggest that you first try social media curation, making lists, distilled content, and crowdsourcing before you try on the other two since they are really easy to do if done correctly. Now we arrive at how you can actually find the right content to curate. The process of finding great content to curate might seem complicated, but it gets easier with practice. The word curate comes from the world of museums. People curate collections of valuable material. It’s helpful to keep that in mind for content curation. Curate only high-quality, attention grabbing pieces. To do this you’ll need a source for content that is already popular and has good authority. You can begin with the sites and blogs which you know are popular. If you don’t know any popular sites or need some help finding more, the following tools can help. If you’re looking for a quick way to do this, Buzzsumo makes it easy to find highly popular, viral content, that you can use for your content curation. 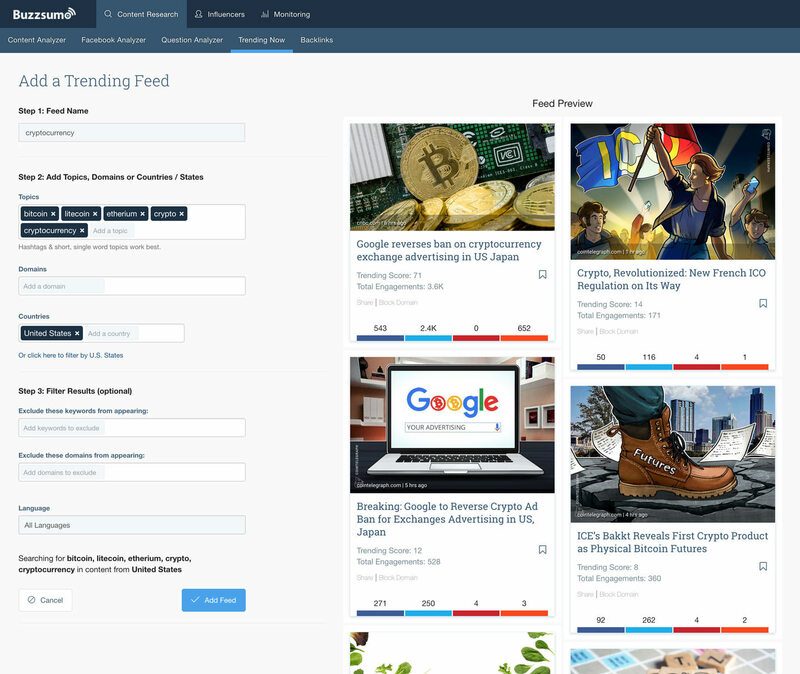 Using BuzzSumo you can find the most popular and trending content based on keywords. You can also filter your searches by country of origin, language, content type, and more to help refine your results. Another way you can source great, relevant, and trending content is to use Twitter. It’s “what’s happening right now” culture makes it a prime place for trending articles, memes, or news. 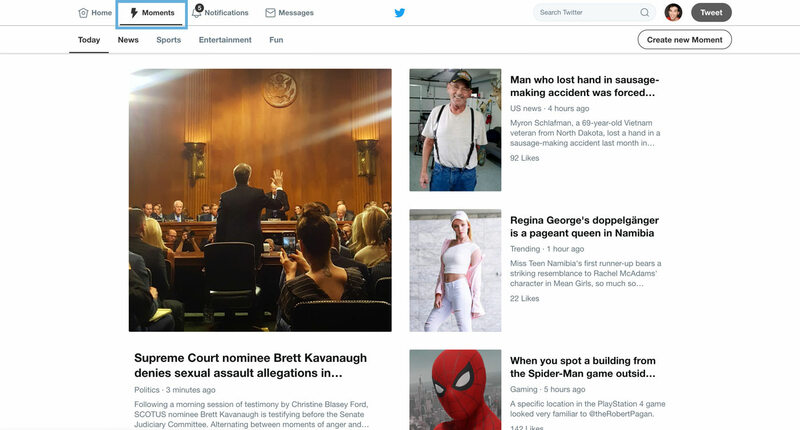 Simply head over to the “Moments” tab on Desktop or mobile. There you will find the day’s most talked-about topics and most shared content. 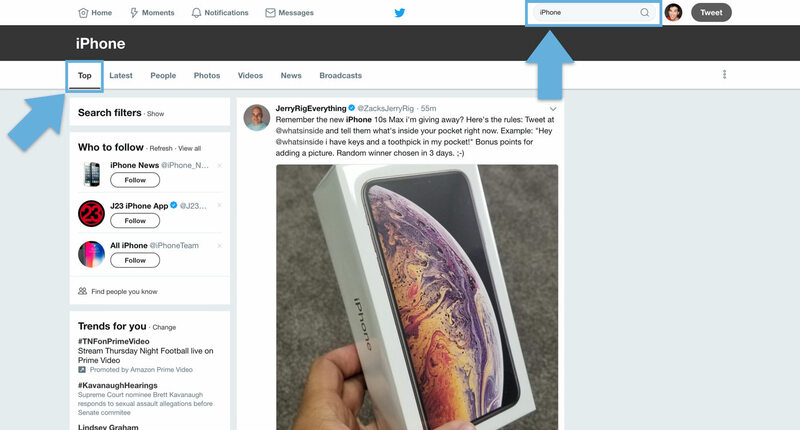 If you’re not finding anything relevant to your industry there, you can always just perform a keyword search on Twitter and it will automatically return the most popular Tweets around that topic. Or if you really want to dig through Twitter to find targeted content, use Twitter Advanced Search to further refine your results. You can sort popular posts on Reddit based on what “Hot” or “Rising” and even filter those results by your target country. While Reddit is a great way to find popular/trending content, it’s not the best at search. So don’t fret if you can’t seem to find the best content relevant to your target audience or market. Trending topics are very good to ride on since it means you are looking to hook your audience on what is currently popular. It also means that there is a lot of content out there ripe for the picking! Once you check what the current trending topics are (and make sure that it fits your industry) then it’s time to step back and look at what angles have not yet been covered. For example, if you decide to ride on a Star Wars trend, check to see what people are talking about, but create your own interesting take on the topic. For example If everyone says negative things about a new movie, do the opposite, write what is interesting about it. It might sound complicated at first, but again, you need to think outside-the-box in order to pull this off. Your audience doesn’t need more of the same thing, they need a different angle, and only your voice can provide it. Pro Tip: BuzzSumo can save you time discovering what is currently trending. 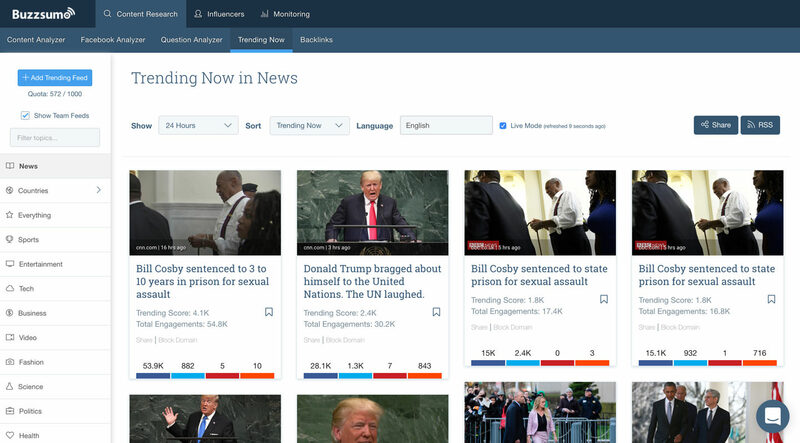 Use Trending Now tab to check trending topics in a subject area, from a particular country or state, or from the entire web. It also has a Live Mode which makes sure you get the latest trending topics in real time. 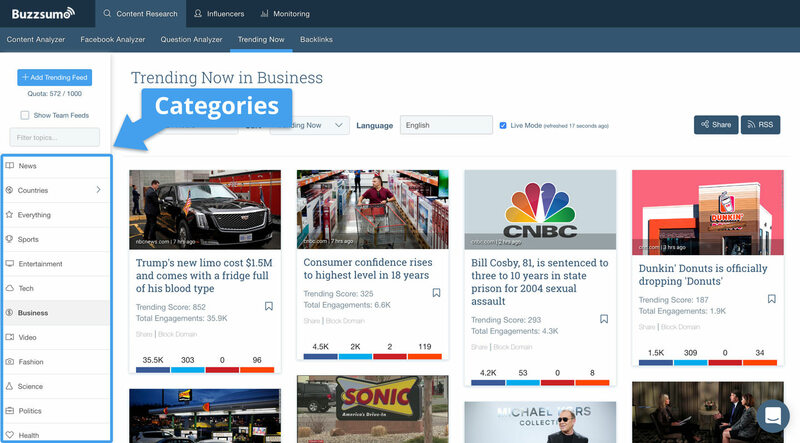 Trending comes with set categories for popular topics. Or you can type in your own keywords and save them so that you can come back to that trending search quickly. The feeds change constantly, so it’s a good idea to check on them often. This one feature alone can save you hours searching for great content. Facebook is the largest social media network. Facebook also suffers from content saturation, but we aren’t afraid of that now, are we? Your competitors likely use Facebook, too, so it’s a good place to check out what is popular on their pages, curate the best content, and add your own spin to it. Use Facebook to find the best, most engaging content. 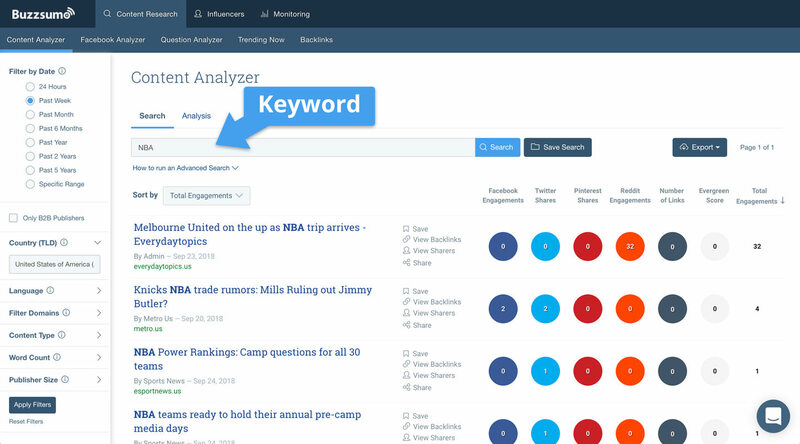 BuzzSumo’s Facebook Analyzer makes checking out top Facebook content a breeze. Find the Facebook posts that get the most engagement ,so you can replicate what’s working. 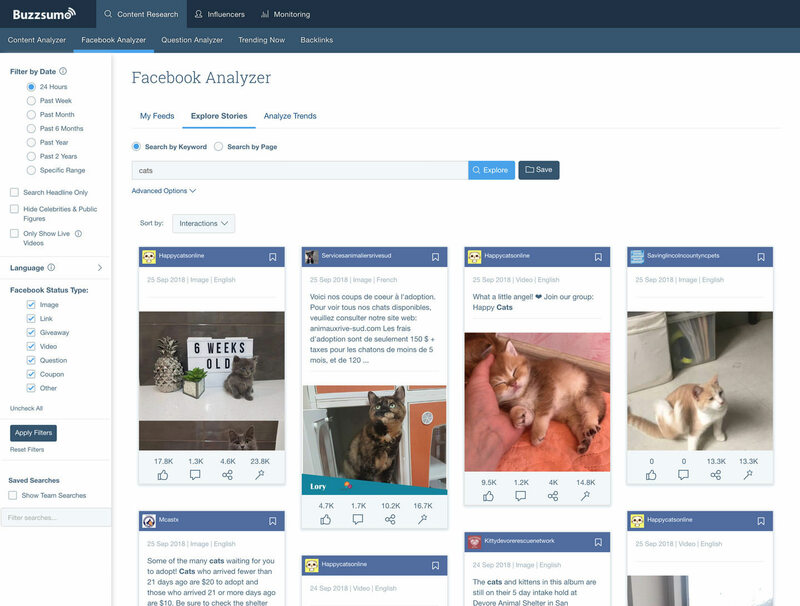 The platform also shows trends such as engagement over time, engagements per post type, engagements by character range, and best times to post. You basically have a full suite of intelligence tools at your disposal, making curating the right content at the right time super easy. Do you remember when we talked about influencers in the crowdsourcing point above? This is a very effective tactic because influencer marketing is a large part of today’s digital world. Influencers are very popular in their industry. What they say usually moves a lot of people who follow them. Leverage the power of influencers by creating a curated post with multiple influencers talking about a certain topic. Do this well, and you could start attracting new followers by the truckload. 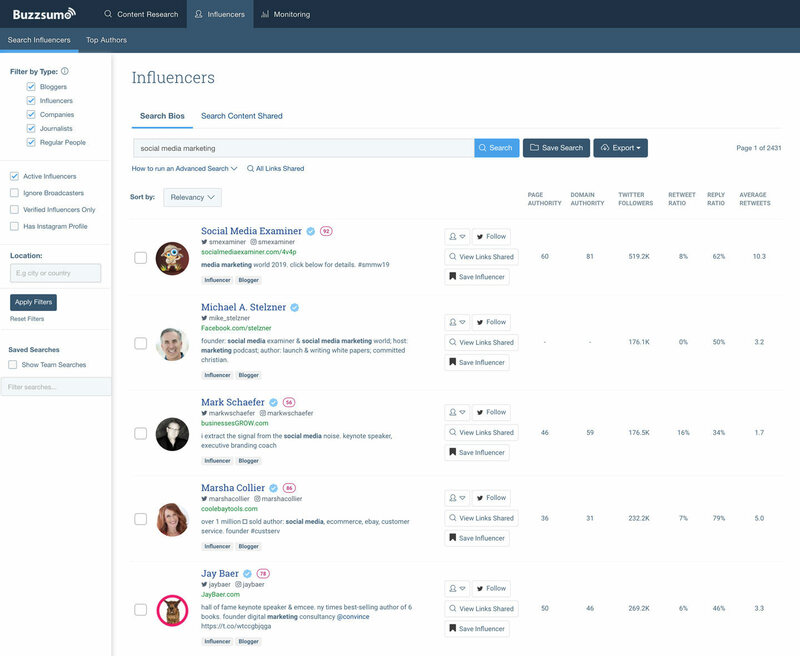 BuzzSumo’s Influencers tab allows find top influencers for a certain topic or industry. Not only does it show you the top influencers for a specific niche, it also shows you what types of content they share via the Search Content Shared tab. This is immensely valuable data. Curate a post featuring these influencers and you will have a high chance of being shared by influencers. This is probably the best tip we can give you in curating content. If you really want to stay on top-of-mind for your audience, then give them curated content that they find value in. Don’t just provide the “What this is” type of content, but focus on the “Why this is important” aspect. Curate content consistently. Update your curated lists to mirror what currently works in your industry or your audience’s evolving needs. Don’t be afraid to provoke healthy discussion in order to generate a solid flow of engagement to your content pieces. Content curation is a powerful strategy you can use to grow your audience and continually prove to them that their attention is well spent on you. We’d like to know your thoughts! Do you curate content regularly for your audience? Let us know your thoughts in the comments below.